Economic woes eating up your Halloween budget? If you’ve got a well-stocked color printer and some glue, then we’ve got you covered! If you have a lot of spare time and patience, you might want to try making the “following portraits” of Frankenstein’s monster and Dracula available at Frankenpaper. Haunted Dimensions offers papercraft versions of tombstones and other things associated with Disney’s Haunted Mansion. 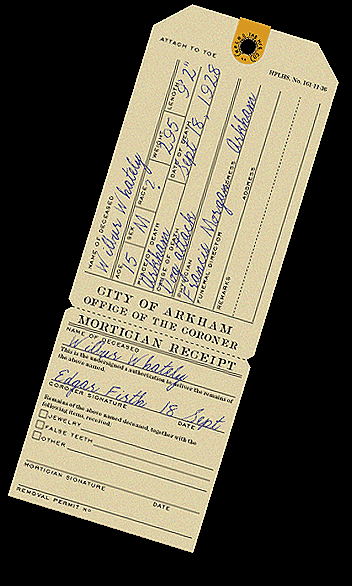 The H. P. Lovecraft Historical Society offers up toe tags, death certificates and a Miskatonic University diploma that are perfect for haunted houses. You can spook up any non-digital clocks in your house using the “13 hour clock” images from the Monster Maze or the Ghoul Skool. The Halloween section of Canon’s papercraft site has a small assortment of kid-friendly masks and cards. Those who want more serious decorations can try assembling the realistic papercraft snowy owls (Great for Harry Potter-inspired setups) and a cat that I’m sure can be easily modified into a black cat. I’ve saved the best for last: RavensBlight has printable games, masks, paintings, and other cool stuff (like this creepy little fellow). There’s even free music! The image illustrating this article was licensed under a Creative Commons Attribution-NonCommercial-ShareAlike 3.0 License. The rest of the article is copyrighted by Gravedigger’s Local 16. Please see the individual terms of each project to verify what license(s) they are available under (if any).